The idea of the payday loan — a short-term, high-interest loan intended to help the borrower stay afloat until his next paycheck — is not inherently a bad notion. However, a new study confirms what we’ve been saying for years: That many payday borrowers are taking out loans they can’t pay back in the short-term, and that lenders rely on this revolving door format to keep the fees rolling in. Earlier this week, the Consumer Financial Protection bureau released a white paper [PDF] on the topic of payday lending, looking at how much people are borrowing, how frequently they borrow and how long they stay in debt. As you’d expect, the average payday borrower is not someone with a high-paying job. Only 4% of payday loans are made to consumers earning more than $60,000 per year. Meanwhile, more than two-thirds of payday borrowers have annual incomes below $30,000. The largest chunk of borrowers came from those making between $10,000 and $20,000 per year; this group accounts for nearly one-third of all payday loans. More than half the borrowers in that largest group of borrowers reported receiving some form of public assistance. Overall, nearly one-in-five payday borrowers fell into this category. The CFPB found the median payday loan amount was $350 with the average being $392. While there is no set standard maximum for payday loans, a number of states cap the principal at $500. Lenders generally make money on these loans by charging a fixed fee for every $100 borrowed. These fees generally range between $10-20 per $100 borrowed, with the median being $15 per $100. Some states cap these fees, but there are a few where no such restriction exists. The median APR on a payday loan is 322%, with the average APR being slightly higher at 339%. HOW FREQUENTLY DO THEY BORROW? Payday loans are often thought of as “two-week” loans, which aligns with the data’s median term of 14 days. However, since the terms of these loans are often tied to the borrower’s pay cycle, which can vary by employer and source of income, the average loan length is 18.3 days. And while payday loans are marketed as short-term solutions — get cash now, pay it back in two weeks — the CFPB found that over the course of 12 months, more than one-third of borrowers will take out between 11 and 19 payday loans. Fourteen percent of borrowers will take out 20 or more payday loans within this same time period. It’s on these borrowers that payday lenders make the most money. According to the CFPB, 76% of lenders’ fees come from borrowers taking out at least 11 loans in a year. Meanwhile, even though 13% of borrowers take out a maximum of two payday loans in a year, these loans only account for 2% of the fees earned by lenders. The median borrower takes out 10 payday loans in 12 months and pays a total of $458 in fees on top of the original amount borrowed. One-quarter of borrowers paid at least $781 in fees over the course of 12 months. Unable to pay back the loan when it comes due, many payday borrowers are rolling over one loan into the next. 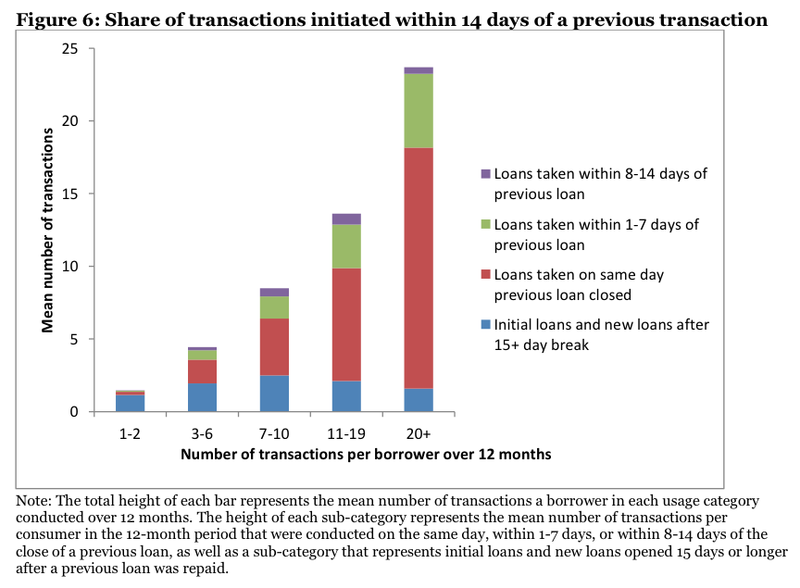 For the borrower taking out eight loans in a year, more than half of those transactions will take place on the same day the previous loan closed. These closing-day transactions, which are effectively just a way to roll the old loan over for another couple of weeks, only grow more prevalent as the number of loans taken out in the year increases. The average payday borrower is in debt for nearly 200 days — more than half a year. 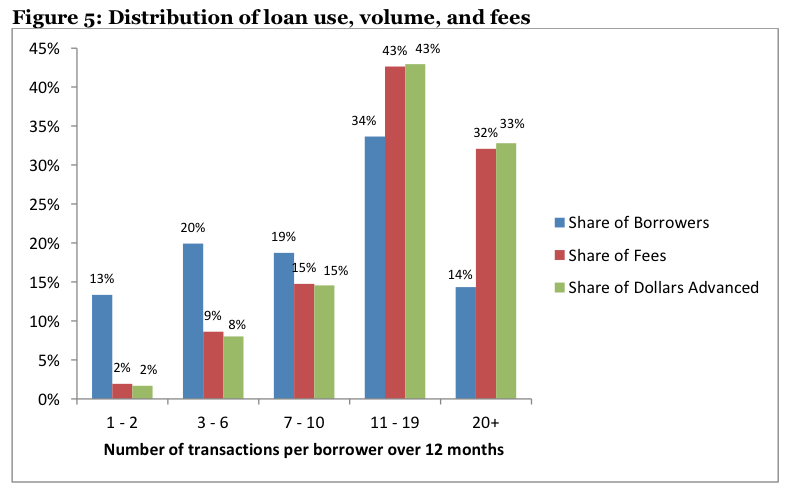 One-in-four borrowers spends at least 83% of their year owing money to payday lenders. This is on top of any debts that borrower might have to other creditors. However, these products may become harmful for consumers when they are used to make up for chronic cash flow shortages. We find that a sizable share of payday loan and deposit advance users conduct transactions on a long-term basis, suggesting that they are unable to fully repay the loan and pay other expenses without taking out a new loan shortly thereafter.